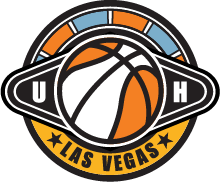 The Ultimate Hoops league is the largest recreational basketball league in the country. Powered by Life Time Fitness, Ultimate Hoops League is a 24/7 oncourt, online, basketball experience. UH offers the best leagues with an interactive statistical website, featuring personal player profiles that turn "Average Joes" into basketball superstars. 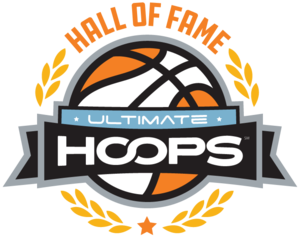 With the ability to track players stats for their entire career, your basketball career begins and ends with Ultimate Hoops. When the playoffs resume in Plano on Tuesday, September 15th, the final 4 teams will be identical from the Spring. Returning again to the final four from last season are the Scoregasms, Massive Jammers, Billy's House, and of course the defending champs, Getting Older. I challenge you to figure out The Soldiers. Scrappy, athletic, all over the place for better or worse and led by Paul Starr and Ike Akotaobi, the ceiling and floor for this team are miles apart. Unfortunately, the platoon needed to upset the second seeded Massive Jammers was not the squad that came out of the gates, but the one that showed up for one final run. With about 6 minutes to play and elimination on the brink, The Soldiers put on a huge run. Led by incredible hustle and determination off the bench from Johntel Franklin (12 points, 8 rebounds, 3 steals, 2 blocks), a spark was lit but one final push came up just short at the buzzer. A strongly defended final possession resulted in a desperation heave from the Jammers that came up way short...right into the arms of a teammate who put in a lay-up at the buzzer to send The Soldiers home and advance the Massive Jammers to the Semi-Finals. Bryan Rollins led the Massive Jammers in scoring with 21, Ryan Zea contributed 17 points, 5 rebounds and 3 assists while Gavin Sontag crashed the boards with 7 rebounds. For The Soldiers, a 3-10 effort --including 0-6 from beyond the arc, his usual playground-- from Paul Starr seemed to seal their fate. Starr did have 7 assists and despite his shooting struggles was the offensive catalyst all game long. Naturally a 4-5 matchup should be a close game. As I said above, the previous round’s closest affair was the 8-9 matchup. Well, this one did not disappoint in this sense...for a while. The defending champs of Getting Older had a tough task with the Raptors, a game that Getting Older Basketball led wire to wire, but by a margin to which that wire could be cut. The thing that decides a GOB game is how well these veterans shoot from the field, particularly beyond the arc. The results were not preferable, as they shot 38% overall and 33% from their coveted 3-point line. The Raptors didn’t fare much better, and to pull the upset this was not a choice. They needed to shoot the ball well but 42% won’t cut it. Missing 7 of 11 free throws (GOB made 14-16) won’t help your cause, either. By the end it was a 17 point win for Getting Older, who pulled away in the final minutes to make the game look a lot less like the close battle it was. 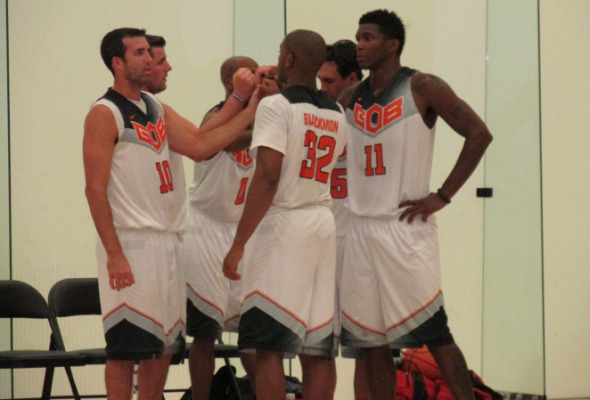 Bryant Nash pulled down 14 rebounds for GOB, adding 7 points and 2 blocks. Four Getting Older players scored in double figures. Ryan Ozata led the Raptors with 19 points and 8 rebounds, adding 3 steals for good measure. If a lower seed was going to do the deed of upsetting a team above them in the rankings, this seemed like the most likely matchup. The Scoregasms gave up 72 points in round 1 and scored 72 in round 2. Put two and two together and defense would need to be played to secure a victory and move on to the Semi-Finals. That’s exactly what they did. The first of the 9:00 contest to get underway, the Torch looked a bit rusty after cruising on Tuesday night to advance. Behind Tom Hatch, the Scoregasms got out to a quick start (insert dirty joke here) and led 36-24 at the Halftime break. It was a balanced attack from the Torch, but nobody really stepped up into the Alpha Dog role that was needed to make a second half comeback. Kreston Martin had 19 points but struggled from beyond the perimeter (1-5), Chris Quincy had 16 and Quinton Taylor added 15 as well as 9 rebounds. Unfortunately his rebound total was 5 more than any other teammate and as a unit the Scoregasms out-glassed the Torch 26 to 18. Ultimately a 50% shooting clip on one end and a 38% mark on the other put this contest to rest. Every Scoregasms player had at least 3 rebounds and all but one hit the offensive glass. The only inferior seed to advance in their Qualifying matchup, there was no time to celebrate for the Backyard All-Stars. They were immediately thrust into the spotlight, one that shines bright behind former Dallas Maverick Justin Dentmon and the team he leads, Billy’s House. The first time for me seeing the Backyard All-Stars in person, they are a group I hope to and anticipate seeing again. They shoot it well, they have an inside presence and defend well, but you can only do so much when the guys on the other end are making the right moves and connecting on the tough shots. Coming off a league record 70 points in Round 1, Dentmon was not to be denied. He finished this one with 57 including 12-18 3 balls. Ho Hum. Just another day at the office for 2012 NBA D-League MVP (Seriously come watch this guy play). The rest of his housemates didn’t disappoint, and any chance of an upset was quickly destroyed at the root. Former Plano West Wolf Jimmie Jones III had 25 points (and 6 assists, 5 rebounds, 3 steals), Harrison George did his usual muscle work scoring 12 and rebounding 12, constant hat-wearer Drew Giddens had an effective game on both ends, scoring 12 of his own with 11 boards and 5 steals. The Backyard All-Stars had 15 turnovers, 9 coming from Wade Havins. A capable team with a great starting 5, they quickly saw their season wrap up at the hands of a powerhouse and thrusted a ton of long distance jumpers in a futile effort to make their way back. They shot 38 as a team, including 15 from Havins (made 5), 12 from Garrett Homan (made 6) and 9 from Nick Scrivens (made 3). Ted McNulty grabbed 13 rebounds (6 offensive, 7 defensive) and were led in scoring by Vincent “Vinny” Colson (no relation to the Marvel character) with 20 points, 7 coming from the Free Throw line on 15 attempts. 75 points would have won them any of the Quarterfinals’ other matchups, but it’s not gonna cut it against Billy’s House.